A Tesla car uses a series of cameras, ultrasonic sensors, and radars that are interpreted by algorithms inside the onboard computer to present a vision of the the road, one that allows its Autopilot software to drive semi-autonomously for extended periods of time. Tesla even says the hardware needed for full self-driving capability is already in place—it is the software that has to catch up. 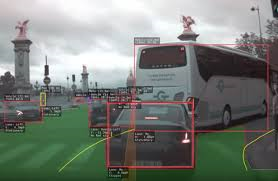 A Tesla car uses a series of cameras, ultrasonic sensors, and radars that are interpreted by algorithms inside the onboard computer to present a vision of the the road, one that allows its Autopilot software to drive semi-autonomously for extended periods of time (albeit with a few crashes here and there). Tesla even says the hardware needed for full self-driving capability is already in place—it is the software that has to catch up. We have no idea how Autopilot actually sees the road—except for when hackers get involved. That is unlikely. But Tesla founder Elon Musk has tweeted that Tesla is about to release Autopilot version 9, its biggest software update in two years, which includes dashcam footage using the car’s Autopilot cameras for the first time.